Your Guide to Government Financial Assistance for Business in Nova Scotia has been published annually since 1993 and covers 483 federal and provincial programs, sub-programs and other initiatives that relate to for-profit companies operating in Nova Scotia. It describes each program; the eligibility requirements together with the application process. It provides 487 contact addresses, phone and fax numbers together with websites. Financing is constantly in a state of flux. New programs and initiatives are announced every year and others fade away without any fanfare. For this reason, this guide is updated annually. It is a monumental task but readers appreciate getting the latest information. If you are looking to finance a business in Nova Scotia, this is the place to start. You can save yourself countless hours of searching for the programs that are best suited to your needs. Whether you are at the start-up stage or wish to expand an existing business, you will benefit greatly from knowing what is available and how to make quick contact with the program managers. It’s all here at your fingertips! Author, Iain Williamson, is an entrepreneur, business consultant and seminar leader. His views have appeared in many newspaper articles. He has also been the guest speaker on a CBC Radio phone-in show on starting a business in a recession. In addition, he has appeared on television shows such as: CBC TV's Venture; TVO's MoneysWorth, and Canada Tonight of BCTV and CHCH Television. Iain spent five years as a financial analyst and knows what makes business tick. For fourteen years he operated his own businesses in importing, high technology and manufacturing. He is now a small business consultant and also owns a book publishing business. He holds degrees from Oxford University, England and from St. Andrew's in Scotland. He has successfully arranged government grants and writes from firsthand experience which he shares with you. This book is essential reading for anyone who is seeking business financing. 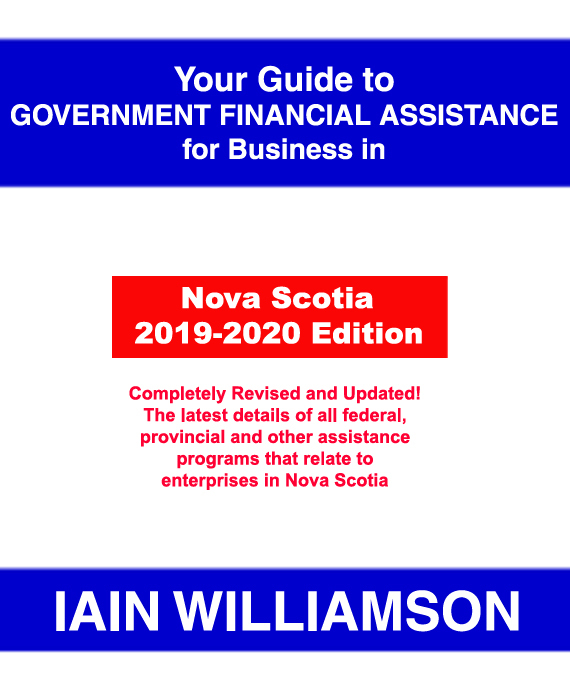 Your Guide to Government Financial Assistance for Business in Nova Scotia: 2018-2019 Edition by Iain Williamson, 278 pages, softcover, ISBN 978-1-55270-804-0; ISSN 1198-0516; published in August 2018; Canadian $99.95.